How many times have you gone out to start your car (truck, SUV) only to find that you’ve done something like left your headlights on? This of course means that you’re going to have a fun time trying to get it started again. Your best bet is to grab a pair of jumper cables (always carry these) and try to find someone willing to give you a jump. However, if you have a Porta-Jump, you won’t need to worry about messing with any of that. This is one of those gadgets that will become almost a necessity to carry around, provided it works as well as it boasts. The cube measures 3” x 3” x 2-1/2”, which is much smaller than any such device I’ve ever seen. All you need to do is plug it into your cigarette adapter and wait for the little green light to come on. Once this happens your car is ready to be started. 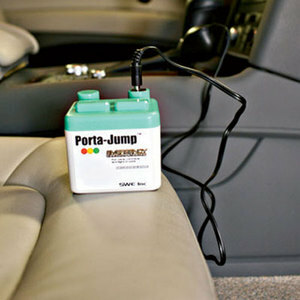 The Porta-Jump is rechargeable, you’ll just need to leave it plugged in (while you’re driving) for about a half hour for a full charge. With it being so small it is perfect to carry around in your glove compartment. At $19.99, there’s no reason not to get one.